A day after Jack Brooks held together Yorkshire’s efforts with the ball against the club he will be joining next season, two half-centuries from players who have made the opposite journey up the M5 in recent times rescued Yorkshire from the risk of the follow-on in the face of a strong bowling effort from Somerset. Admittedly, their reasons for making the journey were different -Tom Kohler-Cadmore returned to the club he represented at age-group level after feeling that the lush grass of New Road was growing long under his feet, while Andrew Hodd was recalled from a Second XI game as an emergency replacement for Jonny Tattersall, who was ruled out of this match with a back spasm. With the home side in danger of being asked to follow on at 119-5, Hodd and Kohler-Cadmore put on a tremendous 173-run partnership to even the match up at the end of day two. But the fact that they were rescued by two men who have not featured significantly in Yorkshire’s red-ball plans this season – one of whom is retiring this year – will temper some of the enthusiasm that home fans will feel after an otherwise heartening day at Headingley. Yorkshire managed to achieve their first objective of the day when they denied Somerset their fifth batting bonus point. Brooks sealed his five-wicket haul when Jamie Overton was caught in the slips, and then Adam Lyth took a sprawling catch at the second attempt to wrap up the visitors’ innings. Harry Brook and Kane Williamson were dismissed cheaply in Yorkshire’s reply, Brook bowled off his pad for two and Williamson was caught in the slips off a delivery that bounced on him. While England’s top were collapsing in a heap at Southampton, it was left to two England rejects in the form of Adam Lyth and Gary Ballance to rebuild the innings for Yorkshire. On the surface they achieved their goal, but both players will feel disappointed by their inability to make a big score in a pointed riposte to the England selectors. Ballance cut strongly and Lyth played some attractive drives, but once the partnership reached 50 Lyth edged low to Marcus Trescothick off the nagging Josh Davey, and his partner followed him three overs later, clipping Craig Overton off his legs straight to Jack Leach for 37. Jack Leaning departed quickly, gifting Davey an easy return catch, to bring Hodd to the crease and on a bright day featuring a good surface, he and Kohler-Cadmore set about restoring Yorkshire’s position in the match with a flurry of boundaries as conditions turned against the seamers. Gaps were found, singles were pushed – there were occasions when the fielders felt they were in with a chance of a run-out – and the pressure turned back onto Somerset. The highlights of the innings undoubtedly came from Kohler-Cadmore’s bat. 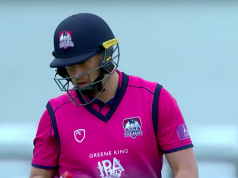 Leach had kept Somerset’s title hopes alive by bowling them to victory against Essex last week, but he stayed a little too short on a pitch that was not offering him any turn. Twice, Kohler-Cadmore stepped down the wicket and coolly lofted him into the building works at the football stand end. Batsmen on both sides have flaked away in this match after getting themselves settled with a respectable score on the board, and with just two overs remaining, Kohler-Cadmore was caught smartly by Steven Davies behind the stumps as the shadows started to draw in. Matthew Fisher perished to the last ball of the day to further dampen Yorkshire’s spirits, but after a long day in the field yesterday and some early jitters, they will be broadly satisfied by their position going into day three. It is hardly a ringing endorsement of Yorkshire’s selection policy, though, that Kohler-Cadmore and Hodd have only played five County Championship matches this season between them. When they reached their 150 partnership, they stood at second and third in Yorkshire’s season averages respectively behind only Jonny Bairstow. While Hodd’s success is a welcome boost to Yorkshire’s survival hopes in the short term, in the longer thinking it highlights a problem for the club: Tattersall has turned to wicket-keeping relatively late in a bid to revive his professional career, and if his body struggles with the demands next season, Hodd’s retirement will leave them without a reliable stand-in. Whoever is behind the stumps will have some big batting shoes, as well as gloves, to fill. Great to see TKC get some First Class runs. England selection obviously effects Yorkshire’s selection policy but development of some players has been mightily disappointing by the White Rose side.